Fit-Ink: What's the Deal with Winter Triathlon? When you live in a cold-weather climate like me, it's not exactly easy to go swimming between November and March. Some will definitely argue that I'm nuts for making this assertion, but it's still one that I'll stand by thanks to a lack of desire to freeze in a pool when it's already cold outside. That and I'd prefer to play in the snow when we have enough of it--which, by the way, does not seem to be happening this winter as most of the storms are skipping Chicago. But there is a way to play in the snow but still feed my triathlon fix, not one that I'd necessary consider for myself but I'd watch others compete. It's name? 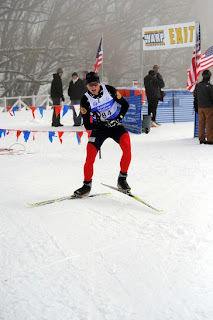 Winter triathlon. It's trifecta? Run, bike, cross-country ski--all on snow. I think I'd be too terrible to try it. I'm far from an ace on nordic skis. My mountain biking doesn't get much, if any, snow practice. And I'm usually on the treadmill or elliptical instead of treading through the snow, unless I've donned my snow boots and need to hustle to an indoor class. But that doesn't mean that you can't give it a shot. I lay down the basics in this story I recently wrote for buzz.snow.com. Check it out here! And stay tuned for more Buzz stories...when I'm not writing here at Fit-Ink (sob! ), chances are I'm over there. Photo grabbed from Scott Sine and USA Triathlon.